Dunder is a unique online casino that was launched in early 2016. 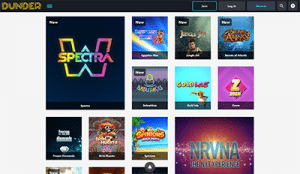 Games are broken down into distinct categories, allowing players to search for very specific features, with titles available from many of the best software providers. It’s an instant-play casino, with all games available directly over your Web browser with no downloads required. Dunder provides a good platform to enjoy a large range of real money casino games, but overall is pretty disappointing when it comes to bonus offers and promotions. Beyond the welcome package, Dunder doesn’t have much to offer as far as bonuses or player rewards go, which is a definite thumbs down in our books. We take a look at Dunder’s promotions and see what bonuses this venue has to offer. First deposit – receive triple your money up to $50, plus receive 180 free spins added to your account daily in instalments of 20 at a time. Second deposit – receive a 50% matched bonus up to $150. Third deposit – receive a 25% matched bonus up to $400. In order to receive the welcome bonuses, you must activate them either from the home page or the deposit page. 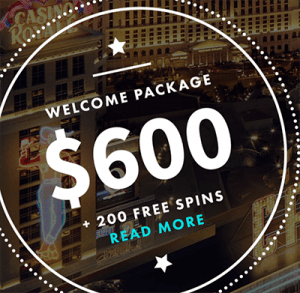 The welcome package is the only bonus currently on offer at Dunder Casino. While the welcome bonus is definitely worth taking advantage of, you may want to move onto one of our other recommended casinos if you’re looking for regular promotional offers. Dunder does not advertise any kind of player loyalty or VIP program on its website and does not yet appear to offer any such reward program. On the plus side, Dunder’s welcome bonus has one of the lowest wagering requirements of any of our recommended online casinos, with a play-through of 25X the amount of the bonus. All winnings made from free spins also come with a 25X wagering requirement before any money can be withdrawn. Different games contribute to the play-through requirements differently, with the pokies and scratchies contributing 100%, table games contributing 10% and video poker not contributing at all. All bonus money expires after 30 days, so make sure to take advantage of your bonus cash while it lasts. The wagering requirements from any one-off promotion are subject to their own terms and conditions, so always be sure to check the fine print before making a deposit to be sure you understand your requirements. While Dunder offers a neat instant-play mobile casino compatible with all data-enabled devices, there are no unique bonus offers available to mobile players. If you’re playing on your smartphone or tablet, you’ll have access to the standard 20 free no-deposit spins and the $600 welcome package. Dunder was only launched in 2016, but within that short time frame it has proven itself to be a reliable and trustworthy casino that pays players fairly and promptly. Withdrawals using web wallets are paid instantly, while credit card payouts can take up to three business days. The casino is licensed by the Malta Gaming Authority and the UK Gambling. The $600 welcome package has been consistent since Dunder’s launch, but there are no records of any other past promotional offers. Pokies – Starburst, Gonzo’s Quest, Twin Spin, Immortal Romance, Gemix, Piggy Riches, Dazzle Me, Thunderstruck II, Esqueleto Explosivo, Mega Moolah, Game of Thrones, Mega Glam Life, Jack & the Beanstalk, Jack Hammer, Taco Brothers. Video poker – All American Multi-Hand, Deuces Wild Multi-Hand, Double Bonus Poker, Double Joker, Jacks or Better Multi-Hand, Joker Wild Multi-Hand, Tens or Better. Blackjack – Blackjack Pro Series, Pirate 21, Pontoon Pro, Single Deck Blackjack Pro, Super 7 Blackjack, Live Blackjack. Roulette – European Roulette, French Roulette, Roulette Advanced, Live Roulette, Live VIP Roulette, Live Immersive Roulette. Table games – Baccarat Pro, Vegas Craps, Casino Hold’em, Punto Banco Pro, Pai Gow Poker, Cyberstud Poker, Red Dog, Triple Chance Hi/Lo, Oasis Poker Pro, live dealer games. Scratchies & other games – 7 Gold Scratch, Hole In One, Big Break, Big Foot Golden Ghouls, Bunny Boiler, Enchanted Woods, Mayan Bingo, Hexaline, Crown & Anchor, Samba Bingo, The Snake Charmer, Hand to Hand Combat. Visit Dunder Casino to claim your new player welcome bonus of up to $600 plus receive 200 free spins.